Sometimes one shot won’t do the trick. On a shotgun, there are two barrels, each holding a separate cartridge, and a hunter must use both to accomplish his task. In poker, if you’re willing to fire the first barrel, you often must be willing to fire the second. You might just find that you bag an increase in your win rate. Did you say raise? I hope so. This is a standard play, from the button, with K8 suited (which is a top 20% hand if you did not know). I would raise to 3.5 big blinds here, a fairly standard cash game raise. If you said call or fold, you are not playing aggressively enough, especially in a 6-max game. The big blind calls. The flop comes T-7-3 rainbow. You have nothing except king-high. The big blind checks. You have no information indicating that the big blind is anything other than a average player. What’s your play? Generally correct answer for all levels of no limit holdem: bet one-half to two-thirds of the pot. There are lots of hands that a loose caller might smooth call your preflop bet with here: Ace-any, middle or low pair, suited connectors, two broadway cards like KJ, and a lot of those hands in the caller’s range will fold to a reasonable flop bet. You bet 2/3 of the pot and the Big Blind calls. The turn is a Q. The BB checks. What’s your play? Fire the second barrel. You have nothing, and you’re unlikely to win the hand if it goes to showdown. If your opponent called preflop and on the flop with a hand such as 66, there are now three overcards on the board for you to have paired, and he’s still missed his set. If your opponent called on the flop with 98, he had sufficient implied odds to call your flop bet, but by betting 2/3 pot again, we deny him the odds to draw again. If you consider all of the hands that might call preflop here, there are lots of them that we are either 1) ahead of, or 2) behind but we can push them out of the pot. Since we don’t know whether we are ahead at this point, we must take the aggressive action as a general rule. When we have a hand with no showdown value. If you are holding a marginal hand like 66 on a T-7-3-Q board, and your lone opponent check-called the flop, and now checks to you on the turn, you may be better served simply checking behind. Your hand has some showdown value, and keeping the pot size small here allows you to evaluate the river. Sometimes with the goods, sometimes with nothing. Don’t make all of your strong post-flop moves with good hands (top pair, good kicker or better in shorthanded, for example). If you get caught showing down king-high occasionally, you’ll be able to get some more action on your good hands. Never against terrible players, especially calling stations. Calling stations are welcome in almost any game, but you have to have something to bet. The better your opponent, the more likely you’ll have success with this play. Out of position with a drawing hand. This is an advantage to let you, not your opponent, determine what price you’ll pay for your draw. You are are in the cutoff seat at a six-max table. You raise to 3 BB preflop with A 8 and only the button calls. You see a flop of Q-9-x with two diamonds. You have a nice draw that you can semi-bluff with, but you are out of position. You were the preflop raiser, so a bet is not out of order. Now you can set the price for your draw on the flop and turn. Usually the drawing player is at a disadvantage in that situation. Here, we have turned the tables. 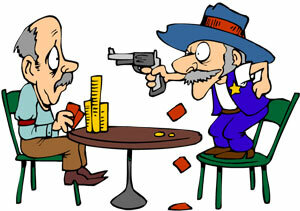 The double barrel move is a great weapon for intermediate No Limit Holdem players to add to their arsenal. It works best against decent or better players, and works better as you move away from micro-stakes. You are more likely to see weak calls at the lowest levels, and you won’t be missing a lot of value if you avoid this move at the lowest levels.